Figs. 1, 2, 3, 4. 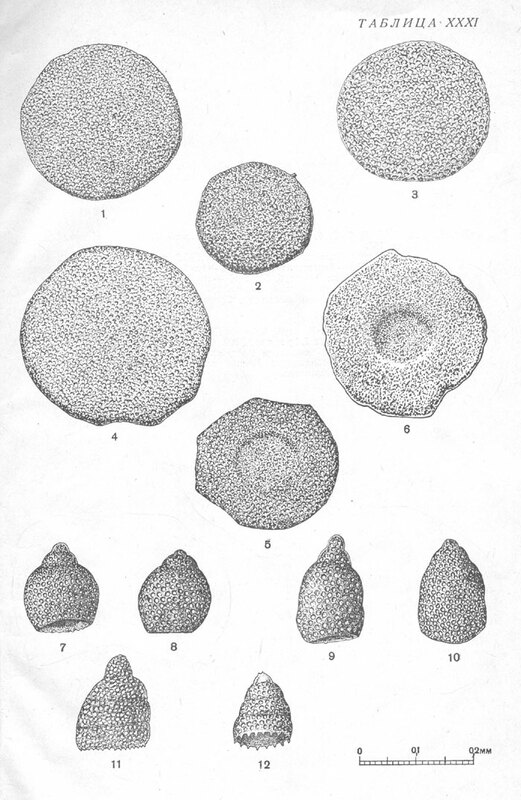 Spongodiscus volgensis Lipman; x180. 1 - typical specimen. Tyumen reference bore hole 1-R, dept 514,90 m; 2 - Tyumen reference bore hole 1-R, dept 527,2 m; 4 - dept 530 m. Santonian-Campanian, lower radiolarian assemblage; 3 - Tyumen reference bore hole 1-R, dept 775 m. Turonian. Figs. 5, 6. Spongodiscus impressus Lipman; x180. 6 - typical specimen. Tyumen reference bore hole 1-R, dept 527,2 m. Santonian-Campanian, lower radiolarian assemblage. Fig. 7, 8. Theocampe sp. ; x180. 7 – Oktyabrsk bore hole 1-R, dept 540,6-546,6 m; 8 - Tyumen reference bore hole 1-R, dept 566-567 m. Santonian-Campanian, lower radiolarian assemblage. Figs. 9, 10. Lithocampe sp. ; x180. 9 - Oktyabrsk bore hole 1-R, dept 540,6-546,6 m; 10 - Tyumen reference bore hole 1-R, dept 566-567 m. Santonian-Campanian, lower radiolarian assemblage. Figs. 11, 12. Dictyomitra sp. ; x180. Tyumen reference bore hole 1-R, 11 - dept 547,1 m; 12 - dept 503,5 m. Santonian-Campanian, lower radiolarian assemblage.